There are basically two reasons why people choose to withhold their identity by writing under a false name: They either fear potentially dangerous repercussions when going public - or they have a personal agenda, and don't have the guts to fight out their position in the open. Under normal circumstances I would simply ignore anonymous letters, but here I have a case I feel I should share with you. It is about a rather clumsy diatribe against shark divers and shark operators quoting a blog Felix posted after he first dove with tiger sharks to make his weak point. The Hawaiian authorities are considering to ban all shark diving operations, and the individual who wrote them a supporting mail signed his message with "Year of the Sharks" - as if he were some sort of a spokesman of the pro-shark initiative to which I and countless other shark protectors belong. The author has got to be a man (no woman could have written such utter non-sense), and I have a suspicion who that person could be. He is in all likelihood a member of an online shark discussion group (SHARK-L), and his diction sounds rather familiar to me. I’m sure you have heard about how shark operators are so very responsible in regards to shark and human safety. What happens behind the scenes is much different than what you hear from the shark diving community. I have attached a personal blog of a diver participating in his first shark dive. I think it speaks for itself as to how Hawaii sharks will be treated and how responsible these money-driven shark diving operators are. BAN, BAN, BAN all shark diving in Hawaii it is a disaster in the making if you don’t, with these “yahoo harass the shark’s divers”. Over a time period of about three months I was completely undecided about coming to South Africa to dive with the tigers. On one hand (and being completely honest) I was afraid. On the other hand I did not want to miss the opportunity of a lifetime to interact with these sharks. Last night I was up until 3AM thinking about what to expect today, talking to my dad trying to clear my mind of all "negative" thoughts (don't mean to sound dramatic). With only about three hours of sleep, I made my way to the launch site. Getting out to the site is half the fun - boat needs to clear breakers crashing into the beach - I guess it was the closest thing I ever felt to being a Navy SEAL. Upon arrival my dad and Steve (Blue Wilderness Team) went in first, I followed only to be disappointed by the visibility. The first two sharks to show up were black fins. My eyes were scanning the whole time for the big ones - nothing. So we moved to another location and from topside we saw the first tiger on the bait. Again, Steve and Wolf went in first followed by Russel and then me. At first I was cautious, holding on to my dad and observing the majestic animals - truly amazing. As I watched the others interact with the sharks, it became apparent that I had worried for nothing, but I was still apprehensive to interact. Then, without choice, I had to - one large shark (14ft) approached me head on, I slowly moved her out of the way by pushing down her head. About 2 mins later I was riding my first tiger shark (Steve took a picture which I will upload soon) - it is impossible to explain the feeling. While some say it is a rush, I say it is being in a state of nirvana - complete harmony with the ocean. While I would never claim that sharks are harmless (as any wild animal - have you ever had a turtle snap at you? ), I would describe them as curious, intelligent, aware, relaxed, and confident. That’s right after two minutes this super responsible dive operator had this person riding Tiger sharks. The operator claims they would never allow anyone to ride, pet, hand feed Tiger sharks on the surface, but behind the scenes, pay enough money and you can do whatever you want to sharks. divers and the responsible shark diving operators doing things they say they never do. I have seen the letter you wrote to the Hawaiian authorities "on behalf of their sharks" wherein you quoted a blog posted by my son Felix. While I am not at all interested in starting an "in-house fight" (I also strongly support the Year of the Shark initiative, and thus feel that we are in the same boat, both you and us), I believe we should discuss this issue in an open and fair manner. - Felix has had no previous experience diving with sharks which is NOT the case; he referred to his first tiger shark dive. At that time we were both in the water, and when he saw me interacting with large tigers, he quickly realized that these sharks are not at all how the media and inexperienced divers paint them (e.g. 'man eaters', 'dangerous', 'aggressive', 'killing machines', etc). 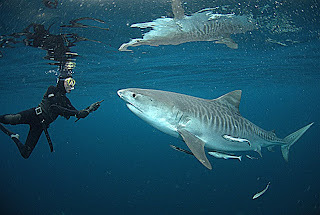 Shark diving in Aliwal Shoal: Felix being investigated by a friendly black tip shark. Felix has dived countless times with smaller sharks such as Galapagos sharks and Caribbean reef sharks, and has, thus, acquired a very solid knowledge of shark behavior. Since I was Felix's guide throughout his long-time exposure to sharks under very different circumstances, he cannot be considered a novice shark diver. I have been freediving with sharks for over 40 years which, I believe, qualifies me as some sort of an authority when it comes to diving, and interacting, with sharks. Me playing with Tiger Beach (Bahamas) celebrity "Emma" - a most gentle and serene 12-13ft female tiger shark. 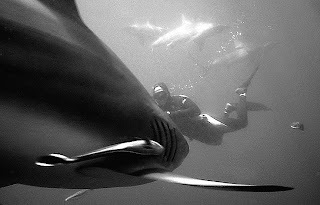 - Mark Addison of Blue Wilderness (Scottburgh / South Africa), the dive operator you refer to, is the pioneer of tiger shark diving South Africa, and has earned a reputation of being a most knowledgeable and responsible shark dive operator. During the 25 years he has been leading tiger shark dives he has never had an accident. That record speaks for itself. I know Mark very well and would consider him one of the best shark operators world-wide. The way you describe him in your letter is utterly malicious, unfair and simply wrong. Perhaps you should have gotten in touch with either Felix or me to get relevant information prior to sending out your letter. I am afraid to say that this is what your letter lacks: solid and checked information. Your letter is emotional and highly charged, and that is not the best way to get your message through. It is by such "initiatives" that much harm is being done to our common cause. Wrong or incomplete information is worse than outright rejection and irrational fear of sharks. So, why not clarify this? Needless to say, Mr. Anonymous did not reply to me letter. Unfortunately, there are way too many "experts" like him (= people with no first hand shark diving experience) who vociferously claim to be knowledgeable about shark behavior, and go public spreading half-truths at best, blatant lies at worst. Whatever these individuals say is highly detrimental to the general perception of sharks. Yet media people such as the producers of "Shark Week" and the editors of the notorious British tabloid "The SUN" love these dilettantes because they help the sensationalist media to reinforce the ever saleable "Jaws" image of the animals so many of us try to protect from human brutality and stupidity, which, as Einstein once stated, is infinite. Actually, what he said was this: "Two things are infinite: the universe and human stupidity; and I'm not sure about the universe."